Possibly Canada’s most famous stamp error, the St. Lawrence Seaway inverted stamp was Canada’s first major printing error. Leading up to the circulation of this inverted stamp, Canada Post had prided itself in guarding against the accidental release of error stamps. Since this was the first significant error of its kind for the Canadian postal service, this stamp is largely coveted by stamp collectors, meaning the value of this stamp is remarkably high. The inverted St. Lawrence Seaway stamp is surprisingly rare, yet no one knows exactly how many there are in existence. 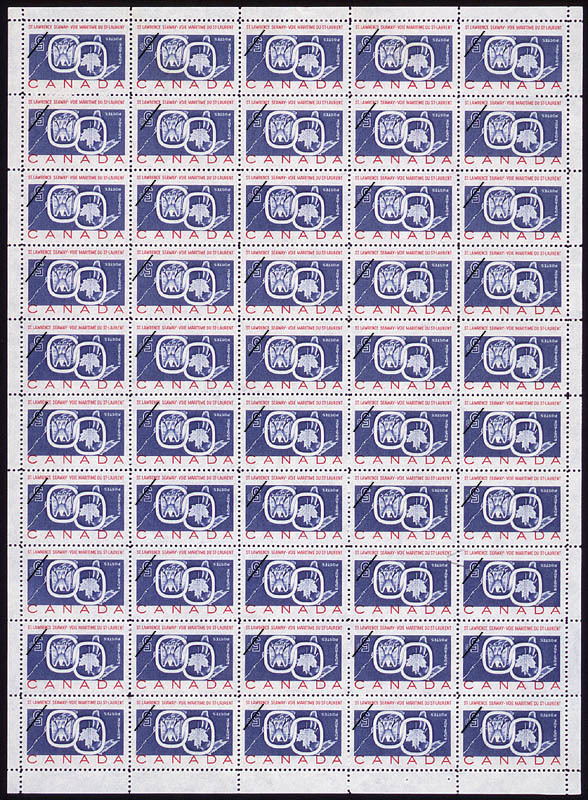 It is estimated that roughly 400 of these stamps exist, mostly in the hands of private owners. Since one pane contained 50 stamps, this would indicate that only 8 error panes survived. How was the Error First Discovered? 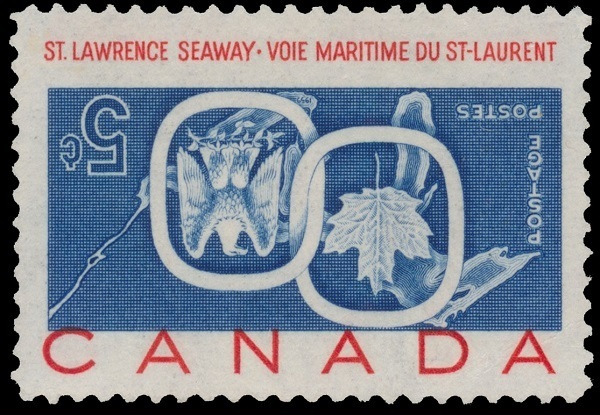 The St. Lawrence Seaway stamp was issued on June 26, 1959, but nearly 2 months passed before the first inverted stamp was uncovered. On August 20th, 1959, a Winnipeg office boy, who worked for the Marlborough Hotel, was asked to purchase 30 stamps. He went to the closest T. Eaton Company department store and asked the teller for thirty stamps. The teller took out a fresh sheet of 50 stamps, tore off a block of 30 and handed them to the boy. The boy returned to the hotel and gave the stamps to the girl at the counter, who ripped off three stamps, placed them on envelopes, and instructed the boy to send them to the post office. At this point, neither of them had noticed that these stamps were inverted, and the three envelopes were mailed out. When the girl tore the next stamp off of the block a little while later, she placed the stamp on an envelope and noticed that the stamp was upside down. She casually turned the stamp over and realized that the stamp text was now inverted! After this discovery, she showed it to her co-workers but did not understand the significance of what she had found. A stamp collector from the hotel staff eventually heard about it and instructed the girl to stop using the stamps. Hoping to acquire the remaining stamps from the pane, they went back to the department store but were told that the rest of the sheet had been sold. The store also searched through their remaining panes but could not find any more inverted stamps. Word about this error travelled across Canada, and post masters began checking their stock for inverted stamps. Since people were initially offering $100-1,000 for this stamp, error panes were becoming moneymakers. One pane was found in Picton, Ontario. Allegedly, 25 stamps from this pane were used by the Bank of Nova Scotia on August 10th, 3 were kept by the person who discovered the pane (one he gave to a friend), and the remaining 22 were sold to a private stamp dealer for $21,250. These remaining 22 stamps were sold as a block of 12 stamps, a block of 4 stamps, one pair, two singles, one on a card, and one that had been damaged. The image below shows one of the stamps that were used by the Bank of Nova Scotia. Two other panes were found in Winnipeg and Peterborough, both of which were sent to Ottawa. These sheets are currently stored in the National Archives of Canada since this inverted stamp has become a piece of Canadian history. An image of the Peterborough pane can be seen below. According to a destruction certificate, the Canadian Bank Note Company, the printer of the St. Lawrence Seaway stamp, internally found and destroyed 19 error sheets. How Did the Error Occur? Given the rarity of this error, it is important to note how this mistake occurred. 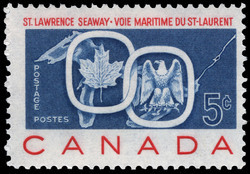 The St. Lawrence Seaway stamp was printed with two colours of ink, red and blue. The technology utilized by the Canadian Bank Note Company to produce this stamp used separate engraving plates to print each colour. This meant that the panes had to be run through the printing process twice, which opened up the potential for human error. For the second pass through the printing press, the panes were inserted backwards, resulting in Canada's most famous stamp error.